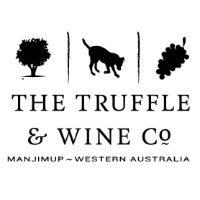 The Truffle & Wine Co. was established in 1997 when a small group of family, friends and business partners invested in a dream to harvest and share Australia’s fresh Black Truffles with the world. This dream was unearthed at the heart of Western Australia’s famed Seven Day Road location, in the town of Manjimup; and became Western Australia’s first commercial truffière. The first distinctly aromatic truffle was unearthed on the 28th of July 2003; a perfect Black Truffle weighing 168 grams. Fast-forward to the 2016 season, the largest truffle found at the farm weighed 832 grams after it was washed and graded and was then auctioned off for charity, raising $2,500 dollars. Today, surrounded by vineyards, orchards and majestic rolling hills, our estate has grown to be known as the single largest producer of Black Truffles (Tuber melanosporum) in the Southern Hemisphere, producing more than half of Australia’s total production (in 2016). For anyone wanting to walk amongst the rows of trees, we tell them the distance needed to be covered is more than 40 kilometres. Experiencing truffle is possible year round in the Cellar Door and the Truffle Restaurant located onsite, where visitors can sample a ‘taste of truffle’ by choosing from a selection of delicious ‘truffle taste plates’ or truffle specialty dishes featuring seasonal ingredients from the Southern Forests region of Western Australia. The Truffle & Wine Co. is one of the few truffières in the world that allow a select number of people each year to participate in the rare privilege of a truffle hunting experience. Walking through the mystical canopy of truffle trees our highly trained truffle dogs will guide you to discover and locate the rare and delicious Black Truffle (Tuber melanosporum). These exclusive truffle hunts are only held during the winter months on our Manjimup farm from late May to late August. These exclusive hunts are a must for foodies and those who love the ‘farm-to plate’ experience. Numbers are strictly limited so book now to experience one of the world’s most exclusive food journeys. Heading South on South West Highway, turn right after the Manjimup Air Strip, onto Seven Day Road. The Truffle and Wine Co visitor's carpark is 7km down Seven Day Road on the right.